Lake Nakuru is home to thousands of pink flamigoes and pelicans. This exotic park boasts of a rich concentration of wildlife including black and white colobus monkeys and is also a Rhino sanctuary. Look for temperamental black rhinos browsing in the bushes, and larger white rhinos cropping grass along the lakeside. No where else will get a photo of a rhino with a back drop of pink flamngos sifting food from a shimmering lake. This is a shallow alkaline lake that is about 60 square kilometers in size. It is set in a picturesque landscape surrounded by woodlands and grassland close to Nakuru town. The landscape includes areas of marsh and grasslands alternating with rocky cliffs and outcrops, stretches of acacia woodland and rocky hillsides covered with a Euphorbia forest on the eastern perimeter. Lake Nakuru is bordered by Menengai crater to the north, the Bahati hills to the north east, the lion hill ranges to the east, eburu crater to the south and the mau escarpment to the west. Three major rivers, the njoro, makalia and enderit drain into the lake, together with treated water from the town's sewage works and the outflow from several springs along the shore. The park was first gazetted as a bird sanctuary in 1960 and upgraded to National Park status in 1968. A northern extension was added to the park in 1974 and the lake was designated as a Ramsar site in 1990. The foundation of the parks food chains is the cyanophyte spirulina platensis which can support huge numbers of lesser flamingo. Nakuru means "Dust or Dusty Place" in Maasai language. 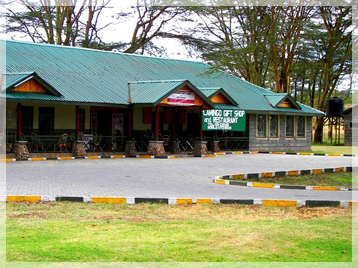 Lake Nakuru National Park, close to Nakuru town, was established in 1961. It started off small, only encompassing the famous lake and the surrounding mountainous vicinity. Now it has been extended to include a large part of the savannahs. Currently, the fenced Lake Nakuru National Park covers around 90 square miles. It has unusual but beautiful vegetation. The forest vegetation is covered with Euphorbia, tall cactus like trees and acacia woodland. The forest region is a host to over 400 migratory bird species from around the world. Nakuru provides the visitor with one of Kenya's best known images. Thousands of flamingo, joined into a massive flock, fringe the shores of this soda lake. A pulsing pink swathe of life that carpets the water, the flamingoes are breathtaking sight. Other wildlife in the Lake Nakuru National Park includes: The famous Black and White rhinos. The Black rhinos have been slowly multiplying over the years, and are well protected. Thanks partially to the government of South Africa.